It’s been a while since I shared some fashion content and although i’m not about to get in front of my tripod in this freezing weather to share some outfit shots, I do want to share a few recent purchases that i’ve added into my winter wardrobe that i’ve been getting so much wear out of over the past few weeks! When it comes to dressing I have and always will be fairly casual and i’m very lucky that with my job I can wear trainers and jeans if I please, but there are days where I do make a little more of an effort with my appearance. Recently i’ve been shopping quite a bit in Primark as I just love their value for money but i’ve also added a few staples into my wardrobe from Topshop of who i’ve shopped at on and off for years, but I do find their quality to be amazing even if they are a little pricey. My favourite purchase of late has been this Topshop Zebra Mix Jumper (£39) which of course has to be sold out online, but I think it’ll still be available in store. I first saw Lily Melrose wearing this but it wasn’t until I saw it in person that I knew I just had to have it! 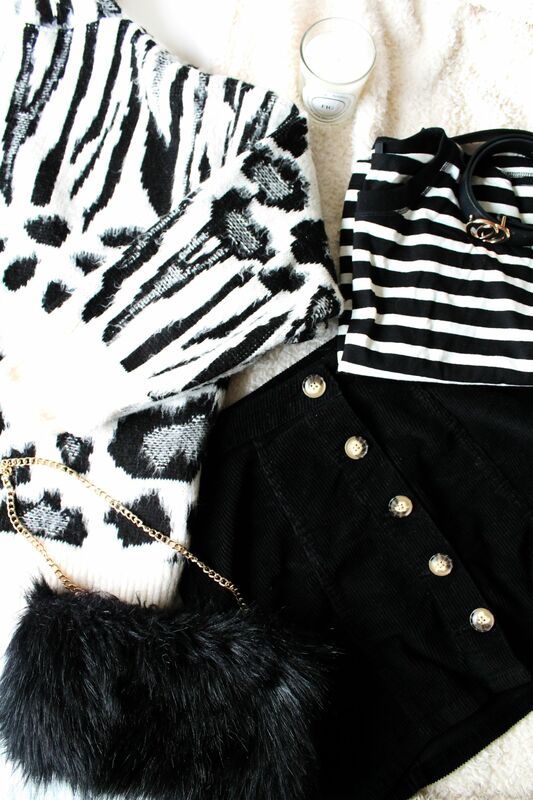 I’ve been loving anything leopard print recently and I really liked the monochrome look to this jumper. It’s such a snuggly jumper and i’ve been pairing this with a simple black pair of jeans and either my vans for a casual look, or a pair of black boots for a slightly more dressy approach. Finally, my last purchase from Topshop was their Boxy Striped Tee (£12) which I purchased whilst I was in London a few weeks ago and I already own the grey version, and love it so I just had to buy the black and white version. I love slightly boxy cropped fits these days as I find them so flattering and these are so easy to style with a pair of jeans for a casual look. The last item I wanted to share with you is a recent buy from Primark of which i’m not sure if it’s available anymore, but I couldn’t not talk about this Button Front Corduroy Skirt of which i’ve been wearing to death. Style this with a simple long sleeve turtleneck top, tights and boots, and you’re good to go! What have you been purchasing recently for your winter wardrobe?